East Palo Alto basketball fans will soon be able to get important health information as they watch their favorite local girls basketball team. The information will be given to them when Eastside College Prep hosts the Coaches vs. Cancer Girl’s Basketball Tournament. So, in addition to having an opportunity to see some great basketball during the tournament, fans will get written materials showing them how they can get screened for various types of cancer and how they can pursue healthy lifestyles to minimize cancer risk. Players and coaches will wear cancer awareness wristbands. The upcoming tournament will be held at Eastside College Prep at the end of December and it will feature eight girls’ high school basketball teams. Part of the entry fees will be donated to the Jimmy V. Foundation for Cancer Research. Eastside College Prep’s basketball coach, Donovan Blythe, said that he is extremely motivated to have this tournament. Last fall, after having his first colonoscopy, he was diagnosed with early stage colon cancer. He had a successful surgery and required no additional treatment. Coach Blythe said that his cancer experience was a jarring moment, and even more disturbing to him was the reaction he got from his peers after telling them about his condition. “So many people, some even older than I, said 'they had not been screened'. Basketball is my area of expertise, and I think the best vehicle to drive my advocacy for early cancer screening,” Blythe said. 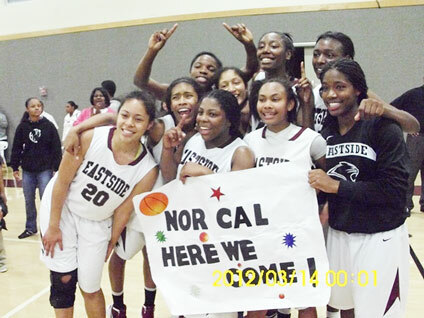 The tournament will be Thursday, Dec 27 – Saturday, Dec. 29, 2012 at Eastside College Prep, 1041 Myrtle St., East Palo Alto, CA. The first game starts at 2:30 pm each day. Admission for children under 5 years old is free, students $5, and $8 for adults. For more information or to donate to the tournament, please call Delores Farrell at (650) 321-0188. Delores Farrell is an East Palo Alto resident and a fan of the Eastside College Prep baskeball team.